We were sitting yesterday with our grandma, and she seemed very thoughtful (more than usual). When we asked her what's the matter, we were almost shocked to hear the question she shot at us. Her exact words: "I've been thinking lately... is there a common thing between cell phones and Minecraft..." We were just about to reply with "Since when did you start caring about cell phones?" when the unsound thought that she might actually know what Minecraft is hit us like a cart pulled by at least a couple of donkeys. Oh, Minecraft! You, blocky game that can unleash the creativity in every one, even in that moron from the block that uses his toothbrush to polish his shoes... We admit it, we actually didn't know that Minecraft is so popular that Nokia would like to use it to promote its latest and greatest product - the Nokia Lumia 920. Apparently, Nokia has partnered with this Minecraft master, Gokuroyu (or Darek), who has spent 14 sweet days designing the Lumia 920 from his dreams. And make no mistake - this is not just a a giant recreation of the Lumia 920. It is inside where all the magic happens, as Gokuroyu (we enjoy typing that name) has used crazy doses of imagination to design various innards like the internal memory, CPU, the Nokia Music feature, camera and so on. For example, the internal memory is represented by a large library, while a night club plays the role of Nokia Music. Great stuff, we tell you! There's even a short interview with the guy over at Nokia Conversations, where he claims that his first phone was the Nokia 3210, his current one is the Nokia 5800 XPM, and that he's desperately saving money for a Lumia 920. The kind of stuff he's supposed to say, we guess. Anyways, hop through the source link if you'd like to read it! What about the 808 Pureview? That's pretty cool, although it would be cooler if the screen could glow. 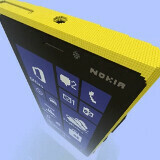 With this sort of effort and creation, I think Nokia could give him a 920, or at least a hefty discount off one! hmm I wonder if Nokia made an 809 windows brand 808 would it sell well to the shutter bug crowd.